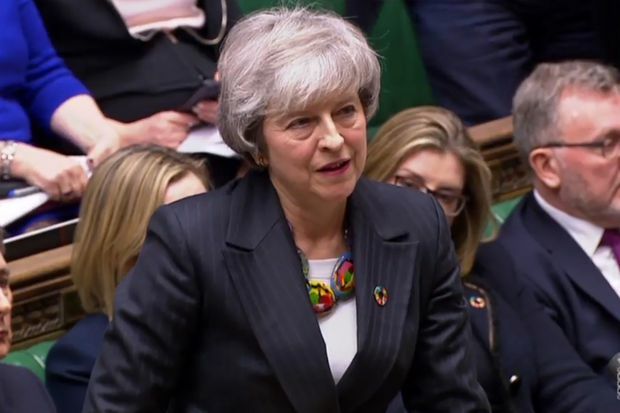 A video grab from footage broadcast by the U.K. Parliament's Parliamentary Recording Unit shows British Prime Minister Theresa May in the House of Commons, in London, on Feb. 12, 2019. The United Kingdom is marching toward crashing out of the European Union next month and only a last-minute resolution or delay to Brexit can prevent a messy divorce. On Tuesday, British Prime Minister Theresa May told the House of Commons she needed more time to salvage the EU withdrawal agreement which was soundly rejected by members of Parliament last month. But so far EU officials have refused to make any changes to the agreement, leaving Ms. May scrambling to find a solution that will win enough support among British MPs. Meanwhile, the cost of the growing uncertainty is piling up as business investment all but vanishes and the economy slows to its weakest growth rate in nearly a decade. She promised to update Parliament at the end of the month but there is growing concern the talks will drag on into March and that the last chance to strike a deal will be at a two-day summit of EU leaders starting on March 21, just eight days before the United Kingdom is slated to leave the bloc. It’s hard to see how Ms. May can strike a compromise that will win over critics. The main sticking point remains the so-called backstop which guarantees the Irish border will remain open by tying Northern Ireland close to EU regulations. Opponents, including dozens of Ms. May’s fellow Conservative MPs, say the backstop defeats the purpose of leaving the EU and they want it removed or amended with a time limit. The EU and Ireland have insisted the backstop must remain in order to uphold the provisions of the 1998 Good Friday Agreement which ended decades of sectarian violence and eliminated border controls between Ireland and Northern Ireland. Ms. May provided few clues on Tuesday as to how she will bridge the impasse and simply told MPs that both sides “agreed that our teams should hold further talks to find a way forward.” She also ruled out requesting the EU to extend the March 29 deadline, although she acknowledged there was little time left to ratify an agreement. Pro-Brexit Tory MPs also pressed Ms. May to obtain legally-binding changes to the backstop, something the EU has ruled out. “It’s clear from our side we are not going to reopen the withdrawal agreement, but we will continue our discussions in the coming days,” the EU’s Brexit negotiator, Michel Barnier, said Monday. Mr. Barnier has said the EU was willing to consider changes to the “political declaration” a 26-page framework for future negotiations on an EU-U.K. trade deal, but many Tory MPs have said that won’t go far enough. Guy Verhofstadt, the European Parliament’s lead Brexit official, expressed exasperation on Tuesday at Ms. May’s comments, saying that she and other British officials have offered no “concrete proposals to break the deadlock."